On appeal, the Second Circuit Court of Appeals held that, based on Supreme Court precedent, if at least one hostile act takes place within the 300 day period, then other acts which happened outside the 300 days remains actionable, meaning an employee can sue based on that conduct. Further, the Second Circuit emphasized that acts from outside the limitations period can also be used as background evidence to support a timely claim. Based on these holdings, the appellate court ruled that all of the conduct which plaintiff alleged constituted a hostile work environment was timely for statute of limitations purposes. The Court next looked at retaliation claims. The Second Circuit re-affirmed the principle that adverse employment actions for retaliation claims are different from retaliation claims. For discrimination claims, adverse employment actions must be a change in the terms and conditions of employment, such as a termination, demotion, or decrease in salary. For retaliation claims, however, the Supreme Court’s standard is lower. For retaliation, adverse employment actions consist of an act which is materially adverse such that it would dissuade a reasonable worker from making a discrimination claim. The Court made one other observation in the decision concerning the standard for summary judgment motions. Typically at the end of discovery for an employment lawsuit, a defendant will make a motion for summary judgment. In a summary judgment motion, the defendant basically asks the judge to dismiss the case because the plaintiff’s evidence cannot establish discrimination or retaliation. For these types of motions, courts must view the evidence in a favorable light for the employee. In plain English, if the employer and employee provide contradicting evidence, the court must believe the employee’s evidence. In Davis-Garett, the Second Circuit hammered home the point that courts cannot make credibility determinations so the trial court was compelled to believe the employee’s sworn statements about what happened to her. Moreover, for hostile work environment claims, trial courts must review the workplace conditions in totality and not piecemeal. Further, when viewing comments in the context of the workplace as a whole, some comments which may appear neutral and non-discriminatory, may then be viewed as discriminatory, such as neutral seeming comments. In sum, in Davis-Garett, the Second Circuit Court of Appeals decided three important issues concerning workplace discrimination and retaliation claims in New York. First, acts which happened outside the 300 day statute of limitations period can be used to support a hostile work environment claim and can also be used as evidence of discrimination. Second, adverse actions for retaliation claims have a lower standard than adverse actions for discrimination claims. Third, when reviewing summary judgment motions in employment cases, trial courts must credit the employee’s evidence and view that evidence in its totality and not piecemeal. 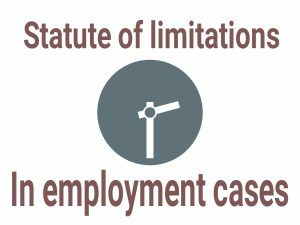 If you have questions about the statute of limitations for employment discrimination cases, adverse employment actions, hostile work environments, or summary judgment, contact a Long Island employment discrimination and retaliation lawyer at Famighetti & Weinick, PLLC. Our website is http://linycemploymentlaw.com and our phone number is 631-352-0050.